SAN JUAN CAPISTRANO, Calif. (BRAIN) — Matt Powell, the vice president and senior industry adviser for sports at The NPD Group, will present the latest retail and consumer shopping trends in the cycling industry at an Interbike session on Sept. 19. SAN JUAN CAPISTRANO, Calif. (BRAIN) — On the heels of the Dirty Kanza, which took place last weekend, Interbike – The Podcast talks to the Emporia event’s organizers including Jim Cummins and LeLan Dains about how the sold-out event went off this year. Show hires retail relations specialist to assist dealers. SAN JUAN CAPISTRANO, Calif. (BRAIN) — Interbike announced Wednesday that additional key brands have committed to Interbike Marketweek including Haibike, Jamis Bicycles, Look Cycle USA, Eddy Merckx and Yuba Bicycles, which will be exhibiting at one or more of the week’s events in Reno-Tahoe. SAN JUAN CAPISTRANO, Calif. (BRAIN) —The self-nomination period has opened for the Interbike Innovation Awards for retailers. SAN JUAN CAPISTRANO, Calif. (BRAIN) — The newest episode of Interbike the Podcast takes a look at how industry media is evolving in the digital age, how brands are choosing to spend their marketing dollars, and the rise of outside public relations firms — rather than the brands themselves — interacting with print and online outlets covering products and the industry. BOULDER, Colo. (BRAIN) — The Bicycle Product Suppliers Association’s Education Committee is asking suppliers to participate in a survey to help shape programming for the Supplier Seminar Series at Interbike Marketweek in September. LONGMONT, Colo. (BRAIN) — Watts Marketing has sold the RenoCross race — formerly CrossVegas — to the RENOCX group. Based in Reno, Nevada, RENOCX is led by Coby Rowe, race director of the USA Cycling Cyclocross National Championship that was held in January in Reno. SAN JUAN CAPISTRANO, Calif. (BRAIN) — The newest episode of Interbike the Podcast is now out, and focuses on the Reno-Tahoe region, home of this September's Interbike Market Week. LAGUNA HILLS, Calif. (BRAIN) — Their friendly faces have welcomed readers at Bicycle Retailer's booth at Interbike for many years. Terry and Irene Moyes, who served in various roles at the publication, including circulation and sales, are retiring from the magazine, where they've worked since its launch in 1992. SAN JUAN CAPISTRANO, Calif. (BRAIN) — Emerald Expositions Events on Thursday reported 4.8 percent revenue growth for the first quarter. Revenue reached $142.2 million, compared with $135.7 million for the same quarter last year. SAN JUAN CAPISTRANO, Calif. (BRAIN) — Interbike has announced the initial wave of content and schedule for the IBD Summit at Interbike, the retail education track at the Interbike show this fall. Show organizers say they have commitments from Cannondale, Pivot Cycles, KHS and other major bike brands. 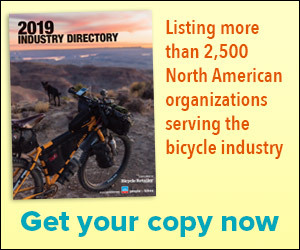 SAN JUAN CAPISTRANO, Calif. (BRAIN) — Registration for retailers, distributors and media opened Thursday for this year's Interbike Marketweek. Meanwhile, show organizers have announced a growing list of exhibitors for the event, which includes the Northstar Free-Ride Festival, the OutDoor Demo and the indoor expo, all in the Reno-Tahoe area from Sept. 14-20. SAN JUAN CAPISTRANO, Calif. (BRAIN) — Interbike announced Wednesday that the Stetina's Sierra Prospect gran fondo will take place during the Northstar Free-Ride Festival, the consumer event that precedes Interbike's trade expo in the Reno-Tahoe areas this September.